Like many Mac Pro owners, I wish Apple offered a Blu-ray optical drive CTO option. Many Mac Pro owners have taken things into their own hands and installed Blu-ray reader/burners. Then they must scrounge around for some software that makes it useful under OS X. That can be a challenge. MCE has decided to make the Blu-ray experience easier for o wners of the Mac Pro (and Power Mac). They are bundling the MCE 12X Blu-ray Recordable Drive with software that enables you to play Blu-ray movies on your Mac Pro's screen. And it gets better. Apple threw us Mac Pro owners a bone in 2011 when they added Blu-ray authoring and burning support to Final Cut Pro X, Final Cut Pro 7, and Compressor 4. Now with the 2011 'Retina' iPad, there is another reason to add a Blu-ray optical drive to your Mac Pro. Why? You can use it along with some new software to convert your Blu-ray movie discs to play at the full 1920x1080 resolution on the new iPad's Retina display. MCE included Blu-ray Player software. We confirmed that Blu-ray movie discs play nicely on our Mac Pro 6-core Westmere with a 27" LED Cinema display. One downside is the fact that the player software requires a yearly renewal fee. MCE gives you the first year free. Using Compressor 4, we encoded and burned a Blu-ray movie disc. It played per normal on our Sony Blu-ray player but it would not play on the Mac Pro. We asked MCE about this. They are aware of the issue and working on a solution. They also informed us that Blu-ray movie discs that are authored by Roxio's Toast 11 Titanium Pro with HD/BD Plug-in will play on the Mac Pro. They will even sell you a copy for $100 (a 33% discount). Our next experiment was to see if we could take a Blu-ray movie disc and rip it to the Mac Pro and transcode it into a format that could be played on the new iPad at the original 1920x1080 resolution. MCE does not include any software to do this but we heard about an app called PavTube Blu-ray Ripper for Mac that does this in a one step process. Using a preset, we used PavTube's software to convert a Blu-ray movie disc to a "Full HD" 1920x1080 MP4 movie that is compatible with the newest 2012 iPad with the 2048x1536 Retina display. The conversion of the 2 hour movie took 1 hour and 40 minutes on our 6-core Mac Pro. It produced a 4.6GB movie file (much smaller than the original movie file). We then imported the MP4 movie file to iTunes and synced it with the new iPad. We played it using the Video app. It looked amazing. Of course, you can also play the converted movie on your Mac using iTunes or Quick Time Player. By the way, if you already have a 1280x720 MP4 movie on your iPhone 4, iPhone 4S, iPad 1 or iPad 2, it will still look very nice playing on the new iPad's Retina display. We confirmed that you can also use Blu-ray discs to back up "non-movie" files that take up more than 4.7GB (the capacity of a DVD). A dual-layer Blu-ray disc can hold up to 50GB. That means you can backup 12,500 music tracks, 50,000 photos, or 4 hours of HD video on a single Blu-ray disc. It also writes to all DVD media and CD media so you can use it as a replacement for your factory SuperDrive. The installation was a snap on our 2010 Mac Pro test mule. You just shut it down, pop out the optical bay frame (disconnecting the power/data cable). Then you either replace the factory SuperDrive or you can install it in the lower bay. Apple even includes the mounting screws for the second optical bay drive. Then reconnect the cables, pop the frame back in, and power up. No special drivers needed. If you do mount the MCE Blu-ray drive in the lower bay, to eject it you press Option Key + Eject Key. The latest Mac Pro is approaching it second birthday. The MCE 12X Blu-ray Recordable Drive would make a nice birthday gift. 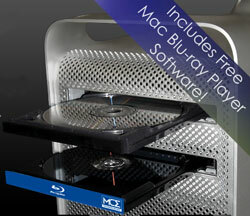 OWC offers a Blu-ray player/burner for the Mac Pro. And since the required software for playing, burning and ripping is not proprietary to MCE, you could put together similar capabilities to the MCE Blu-ray Recordable Drive. Some readers informed me that certain models of LG Blu-ray player/burners work well on their Mac Pro. You must remove the face plate on the tray for it to work with the Mac Pro's optical bay doors. And you must gather the software needed for your tasks. You can order it direct from the MCE Store -- but be sure you order the correct model for your Mac Pro or Power Mac.